(Nanowerk News) There was a time during the early development of portable electronics when the biggest hurdle to overcome was making the device small enough to be considered portable. After the invention of the microprocessor in the early 1970s, miniature, portable electronics have become commonplace and ever since the next challenge has been finding an equally small and reliable power source. Chemical batteries store a lot of energy but require a long period of time for that energy to charge and discharge plus have a limited lifespan. Capacitors charge quickly but cannot store enough charge to work for long enough to be practical. 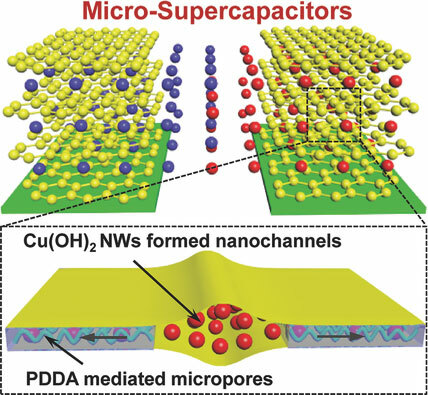 One possible solution is something called a solid-state micro-supercapacitor (MSC). Supercapacitors are armed with the power of a battery and can also sustain that power for a prolonged period time. Researchers have attempted to create MSCs in the past using various hybrids of metals and polymers but none were suitable for practical use. In more recent trials using graphene and carbon nanotubes to make MSCs, the results were similarly lackluster. An international team of researchers led by Young Hee Lee, including scientists from the Center for Integrated Nanostructure Physics at the Institute for Basic Science (IBS) and Department of Energy Science at Sungkyunkwan University in South Korea, has devised a new technique for creating an MSC that doesn’t have the shortcomings of previous attempts but instead delivers high electrochemical performance (" Leaf Vein-Inspired Nanochanneled Graphene Film for Highly Efficient Micro-Supercapacitors"). Inspired by natural vein-textured leaves, a 2D nanochanneled graphene film with high packing density and efficient ion transport pathways is proposed to facilitate high rate capabilities while maintaining high energy density. The 2D nanochannels serve as pathways for efficient ion diffusion parallel to the graphene planes in all-solid-state micro-supercapacitors with interdigitated electrode geometry. To fabricate the MSCs the film was applied to a plastic layer with thin, ∼5µm long parallel gold strips placed on top. Everything not covered by the gold strips was chemically etched away so that only the gold strips on top of a layer of film were left. Gold contact pads perpendicular to the gold strips were added and a conductive gel filled in the remaining spaces and was allowed to solidify. Once peeled from the plastic layer, the finished MSCs resemble clear tape with gold electrical leads on opposite sides.